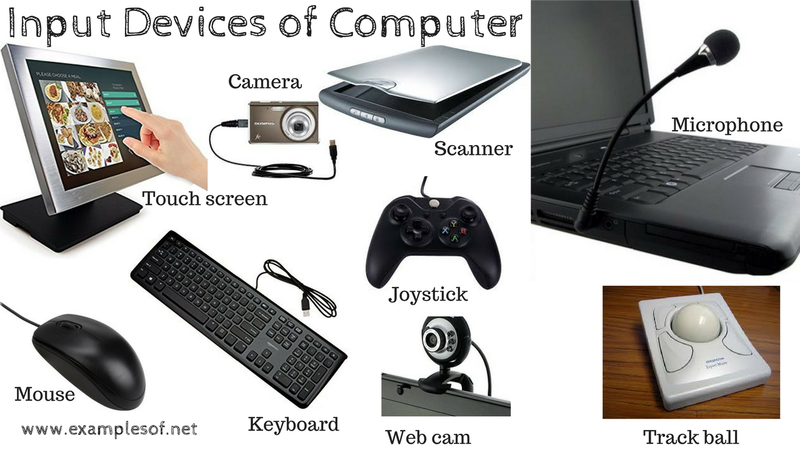 An input device can be defined as an electromechanical devices that allows the user to feed information or data into the computer for analysis, storage and give command to the computer. Input devices accept data and instructions from the user. Generally input devices are manual or direct data entry devices. 1. Keyboard: A keyboard is the most common input device. Generally standard keyboard has 104 keys. 2. Mouse: A mouse is an electro mechanical, hand held device . It is used as a pointer. It can perform functions like selecting menu commands, moving icons, resizing windows, starting programs, and choosing options. 3. Light pen: An input device that utilizes a light-sensitive detector to select objects on a display screen. 4. Optical scanner: These devices are used for automatic data collection. The devices of this category completely eliminate manual input of data. 5. Touch screen: Touch panel displays and pads are now being offered as alternatives to keyboard. 6. Microphone is an input device, which takes voice as input. The voice communication is more error-prone than information through keyboard. There are two types of microphones available: Desktop Microphone and Hand held Microphone. 7. Trackball a pointing device, is a mouse lying on its back. To move the pointer, you rotate the ball with your thumb, your fingers, or the palm of your hand. The advantage of trackballs over mouse is that the trackball is stationary so it does not require much space to use it. In addition, you can place a trackball on any type of surface, including your lap.